It's been a bit dry around here in recent weeks. Many of the small rainforest seedlings have succumbed and some of the larger trees are in a wilted state. But we had a shower of some 6 mm of rain and this has certainly spruced (is this the word in a tropical rainforest!) things up a bit. 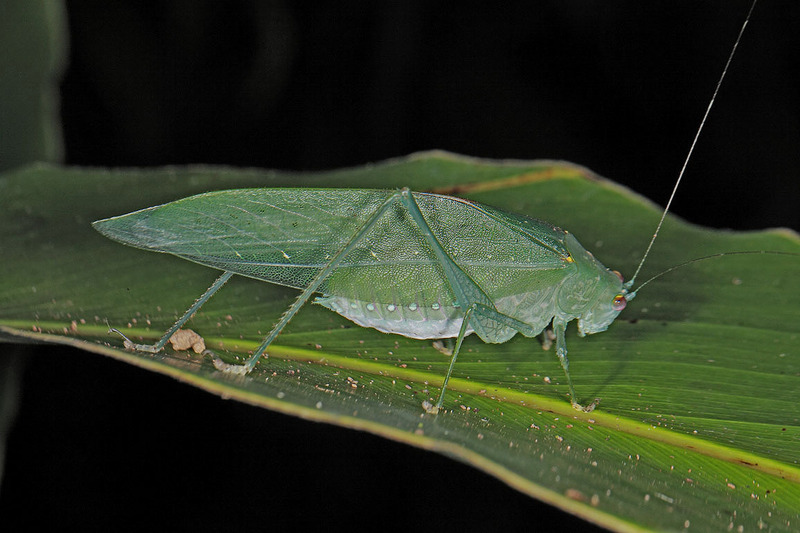 A recent trip to the Daintree region, which was also dry, revealed some nice green katydids. 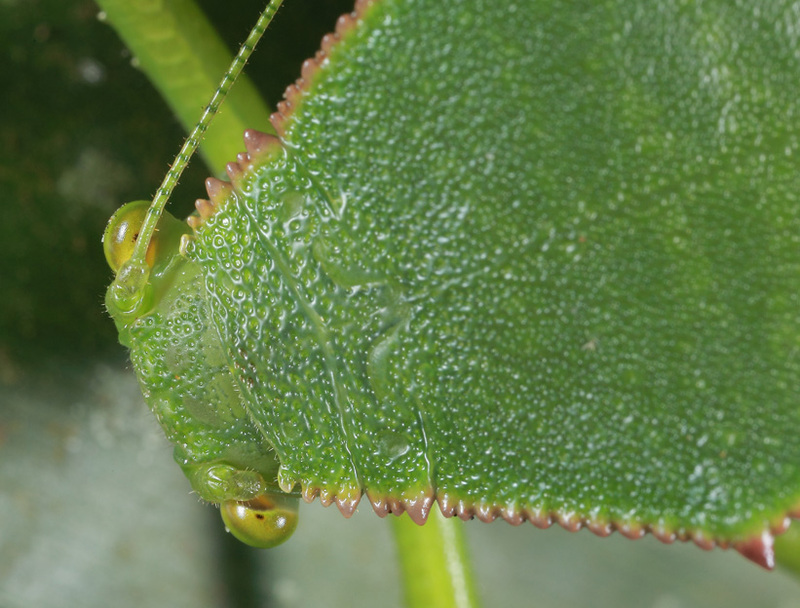 The head above and the two below are the Queensland Small hooded Katydid, reported before in this blog. The unique stridulatory mechanism of the members of the this subfamily is documented in the blog and in the published paper below. Note the resting position with the tegmina and wings slightly spread concealing the soft bits. The katydid ids nocturnal and spends the day either on top, but more usually under, leaves. It is ever alert and at the slightest disturbance, the claws are embedded in the leaf and the tegmina and wings are contracted as below. This provides the katydid with a good grip and helps to prevent it from being "swiped" off the leaf by a passing bird or bat. 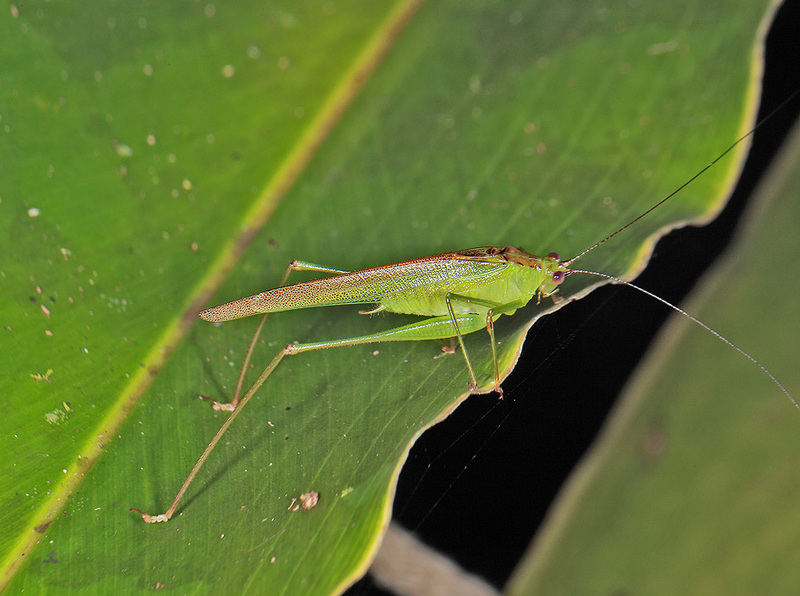 This is a widespread species across tropical Australia. It is one of several katydids that can be found in disturbed habitats such as along rainforest margins or under powerlines that are routinely cleared and there is an abundance of new growth and grasses. 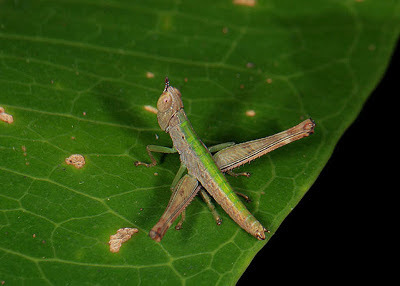 It seems to be a preferred food of the predator, Hexacentrus mundurra Rentz. A common katydid of the rainforest understorey. It may also be in the canopy but no one has looked yet. 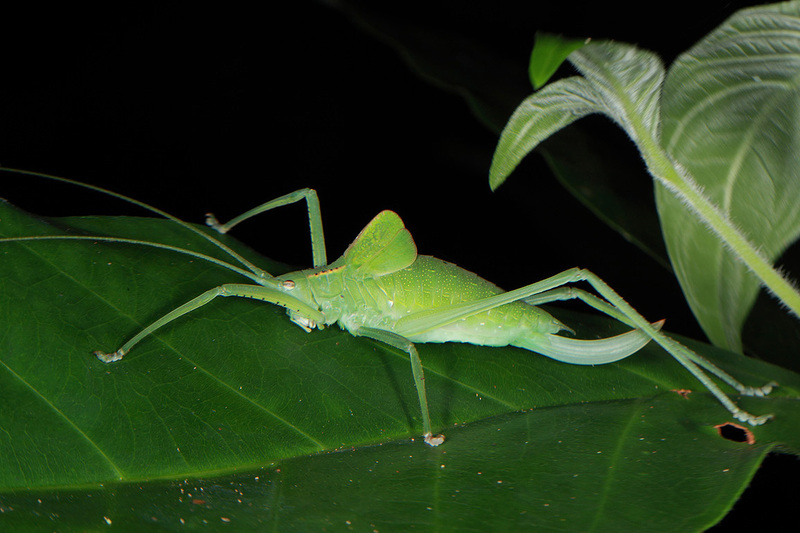 This species could easily be called a "Dinosaur Katydid"! You have seen this katydid before in this blog. It was described from Kuranda as the generic name suggests but it has a broader range, extending from near Innisfail to the Daintree region, Queensland. 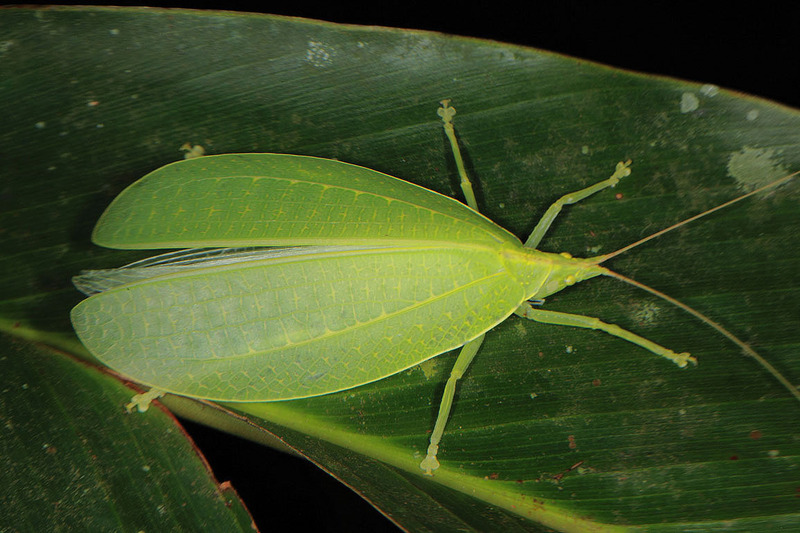 This is the first known record of the species from the Daintree. 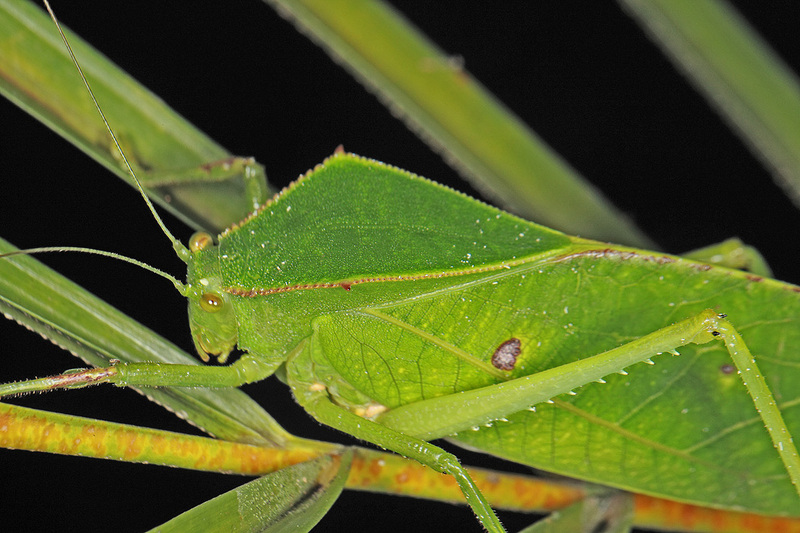 If this species is correctly identified, it has a very unusual distribution for a katydid. 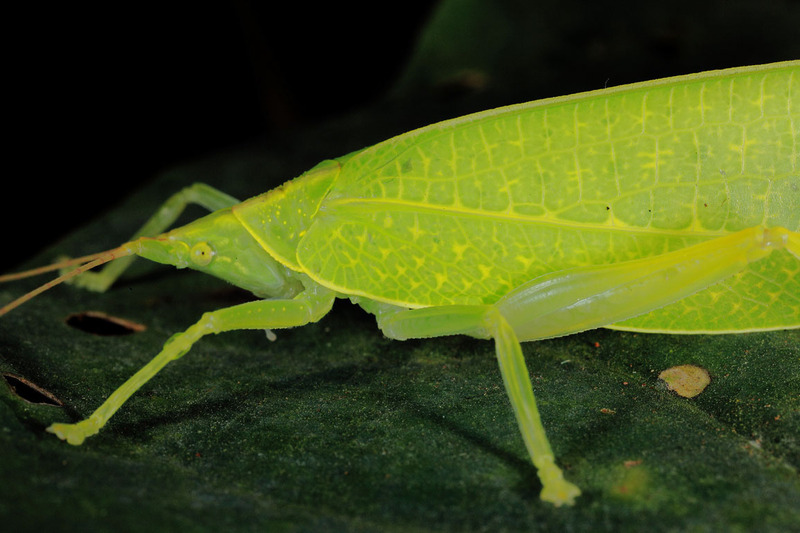 It was described from New Guinea as indicated in the Orthoptera Species File. No other phaneropterine has a similar distribution. But the photos seem to match up. 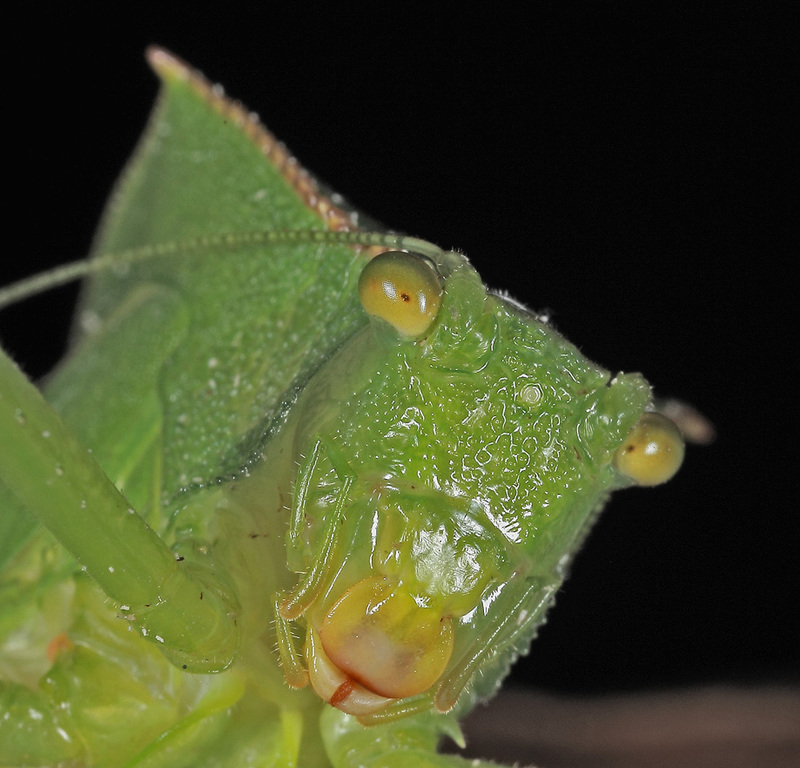 Like so many other katydids, further investigation is warranted. 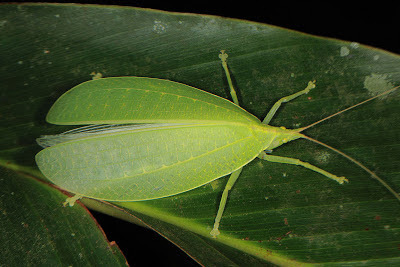 This easily-recognised katydid has a relatively broad geographic distribution for a katydid in the tropics from Tully to Iron Range, Queensland. The bluish green colour and the series of spots on the abdomen combined with the tiny yellow spots that protrude from under the pronotum on each side and yellow on the top of the eye are not possessed by any other katydid. 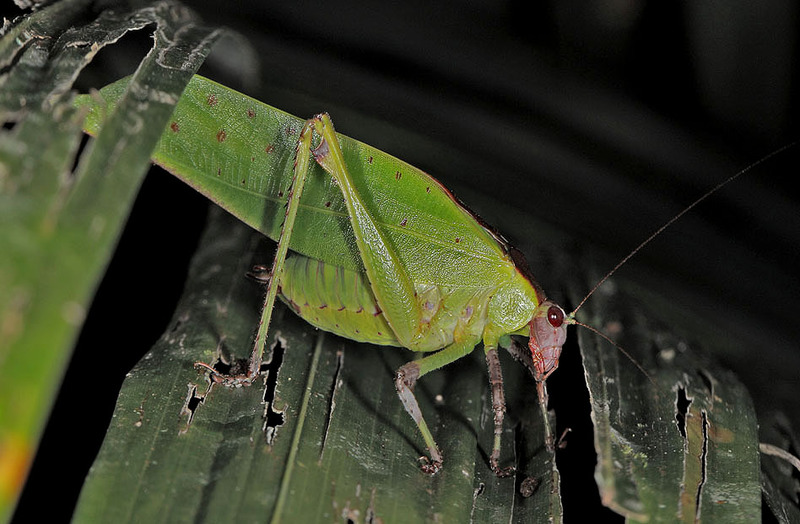 Previously known only from Kuranda, this is the first record of the genus and species from the Daintree, Queeensland. Rentz, DCF, Su, Y-N, Ueshima, N. 2008. 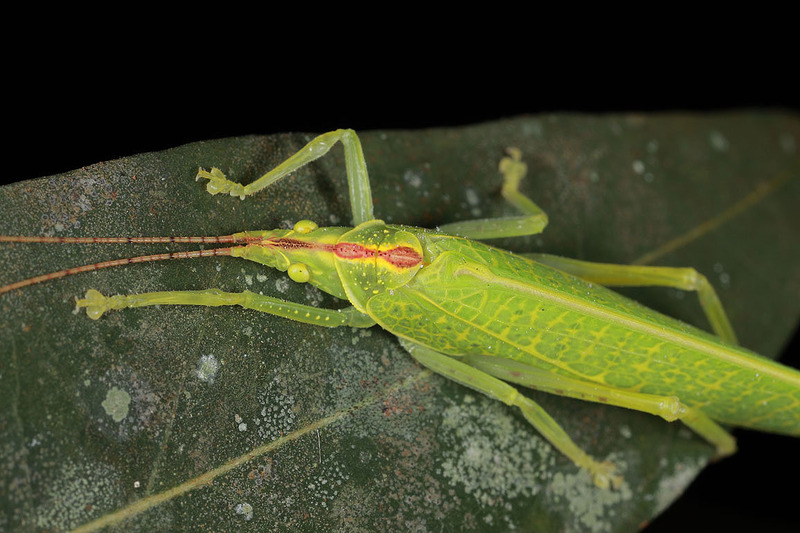 Studies in Australian Tettigoniidae: New Phaneropterine Katydid from Queensland Rainforests (Orthoptera: Tettigoniidae; Phaneropterinae). Zootaxa 1964: 1-39. Rentz, DCF, Su, Y-N, Ueshima, N. 2009. Studies in Australian Tettigoniidae: The Phyllophorinae (Orthoptera: Tettigoniidae; Phyllophorinae). Zootaxa 2075: 55-68. Rentz, DCF, Su, Y-N, Ueshima, N. 2010. 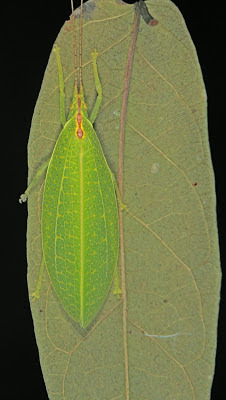 Studies in Australian Tettigoniidae: Australian Pseudophylline katydids (Tettigoniidae; Pseudophyllinae; Phyllomomini). 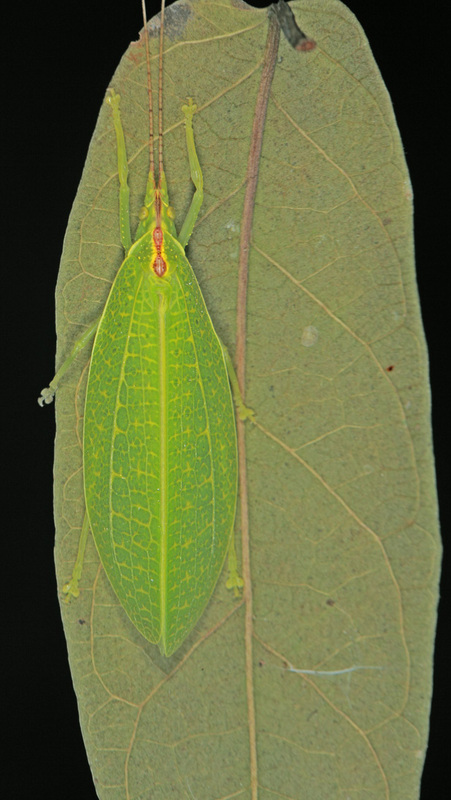 Zootaxa 2566: 1-20. 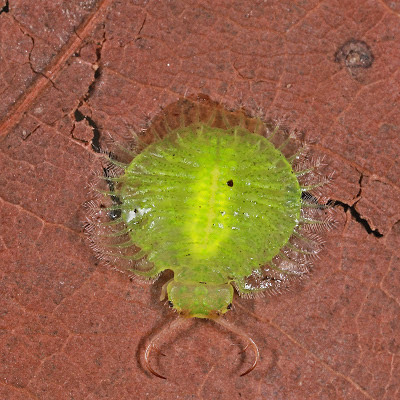 The recent blog depicting the green larva of a member of the Neuroptera family Nymphidae elicited a response from my friend Ms Densey Clyne. 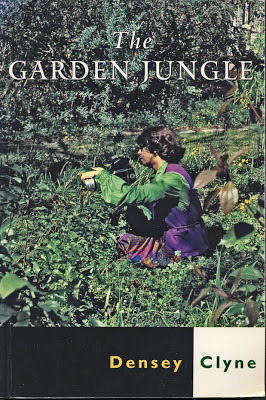 She pointed out that she recorded this behaviour in her popular book the Garden Jungle. I have this book on my shelf and should have recalled her mention of this and other neuropterans. If you can find a copy of the book it is well worth reading. 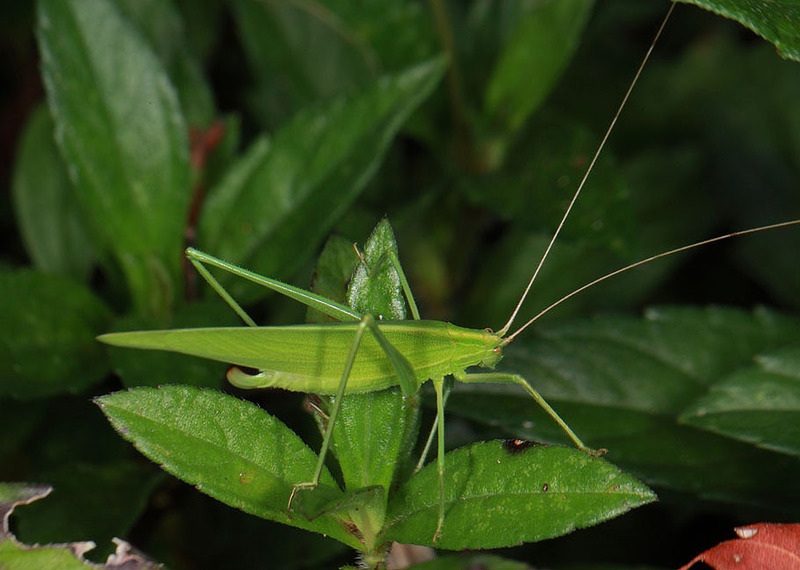 Her former garden in Turramurra, NSW, just north of Sydney, provided a wealth of biological observation. 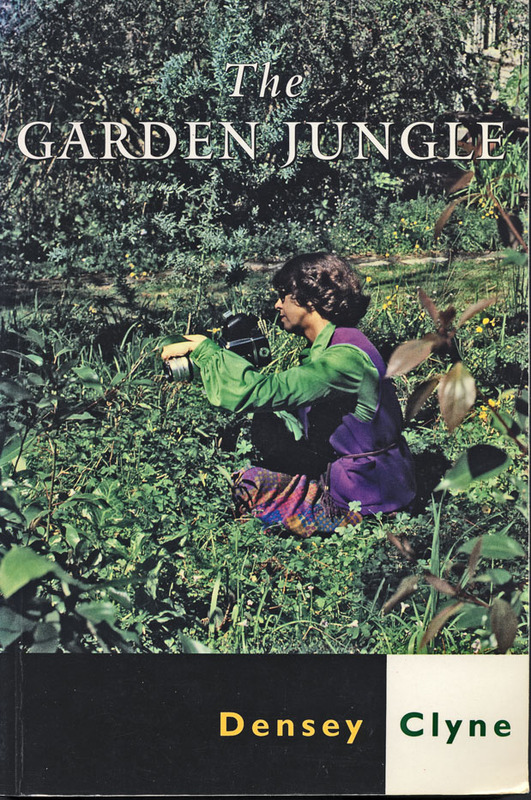 Her observant eye was continually at work documenting the comings-and-goings in her suburban garden. Her photos are outstanding and this combination, and her pleasant personality, lead to stints for several years on Burke's Backyard TV show. Densey has kindly allowed me to use her photos of Osmylops pallidus, photographed in her garden many years ago. 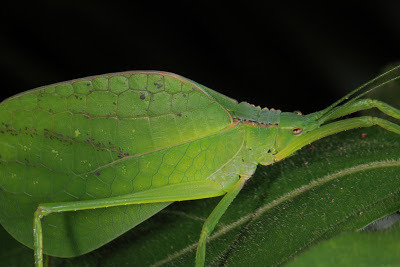 It appears to be the same species as depicted in this blog. The larva is very similar , if not identical to the one photographed in Kuranda. The jaws are agape but secreted beneath the head. 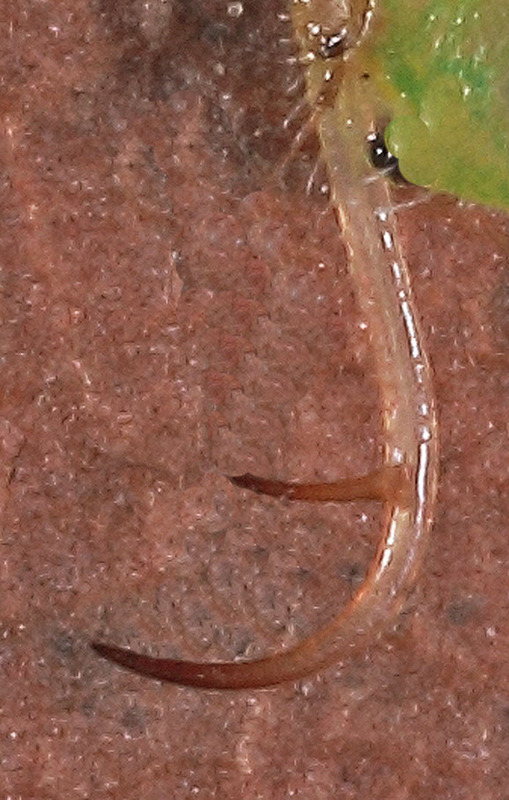 This is the pupal case formed after the larval stage was complete. 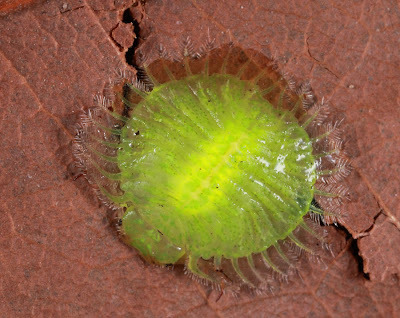 It is on the underside of a leaf. 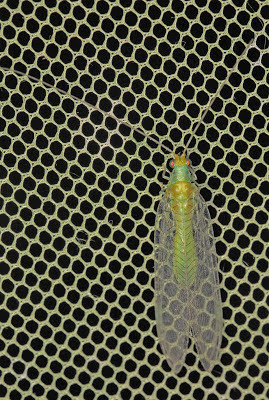 The adult Ruby-eyed Lacewing, Osmylops pallidus. 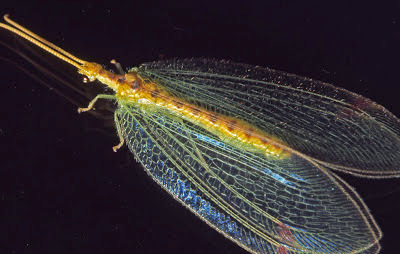 It strongly resembles a green lacewing but differs in several respects. 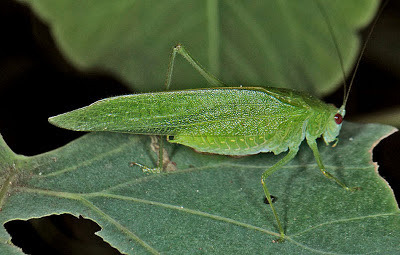 Green lacewings, like the one above, probably in the genus Italochrysa, have a different body plan. 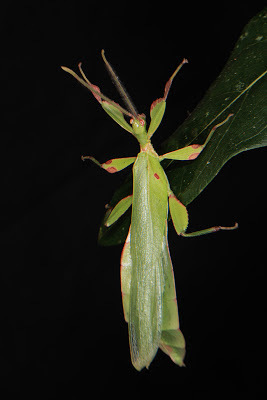 The antennae are much thinner, and the wing venation differs between the two families. 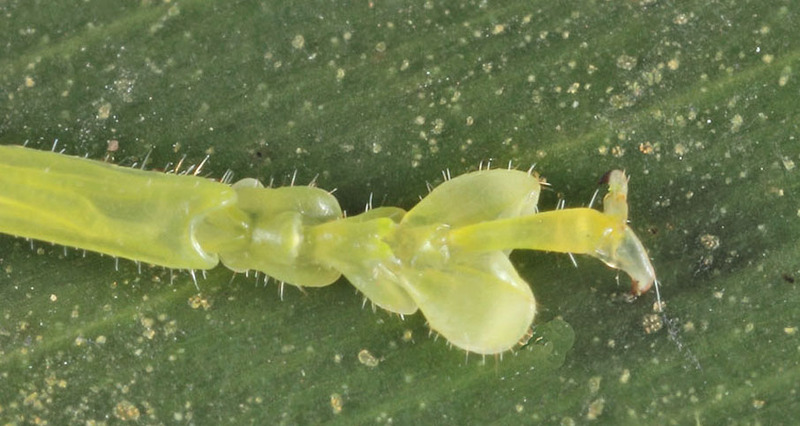 And, of course, the larval life styles are very different as is their morphology. 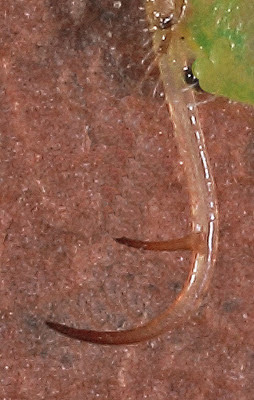 in addition, some nymphids lay eggs on stalks in horse-shoe like rings, interconnected to one another. 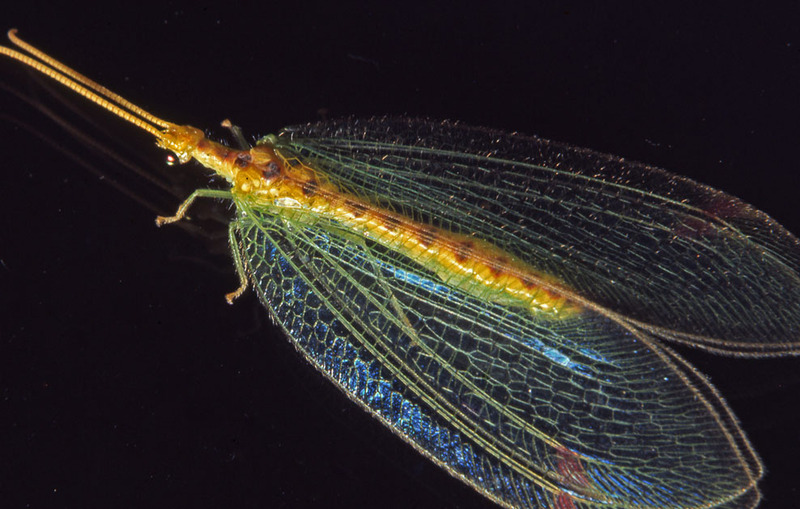 Lacewing eggs are laid in less elaborate fashion. 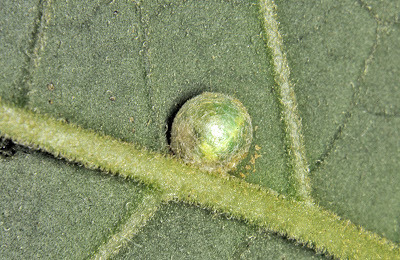 In the case of O. pallidus, Ms Clyne reports that the eggs are in contact with the leaf each on a long stalk. 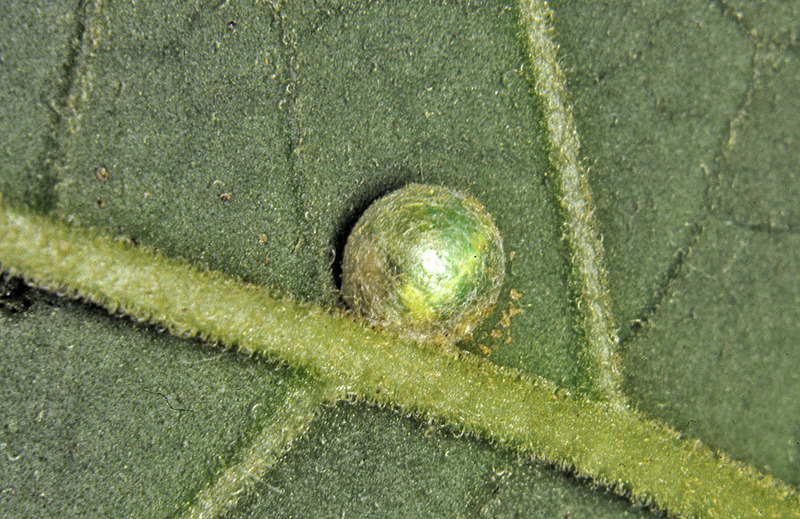 The stalk is bent to form a hoop at its tips with the egg fixed directly to the leaf. 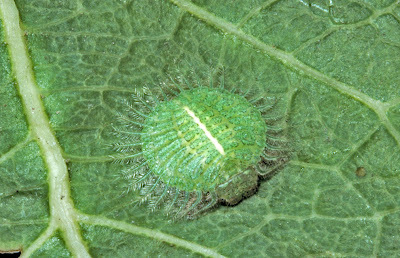 The hoops formed in this manner by the stalks lie parallel to each other forming a tunnel or tube inside which are the eggs, parallel to one another and in a symmetrical row protected by the encircling hoops of sticky silk. Now to find one of those egg masses. Thanks to Densey and to Catherine and Maurice Tauber for help in discussing the biology and morphologyof this little-known group of insects. 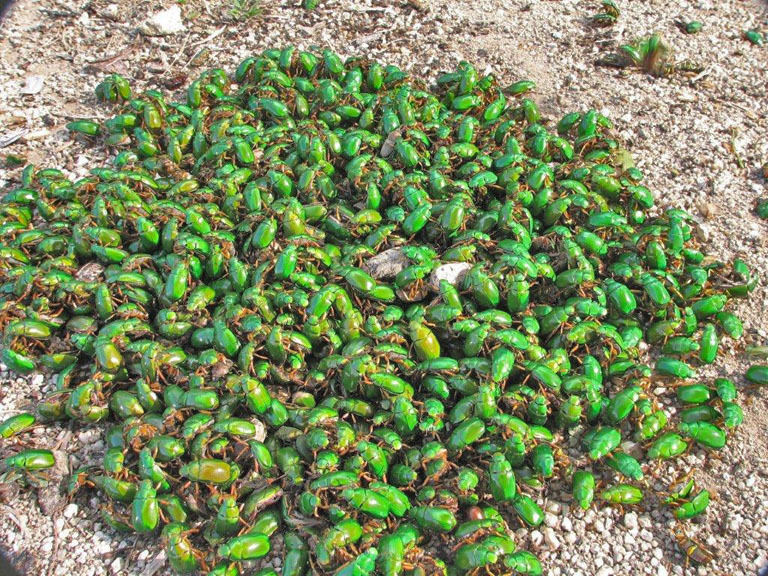 These Christmas Beetles, Anoplognathus smaragdinus, have taken season's greetings to a new level. These were photographed by Jack Hasenpusch at the Australian Insect Farm not far from Innisfail, Queensland. This year has seen a tremendous population explosion of these scarab beetles in his area. 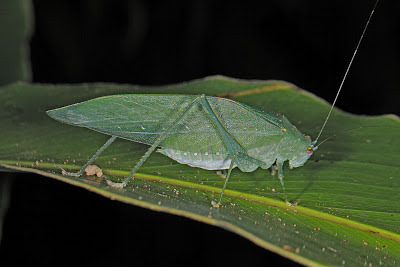 But in the Kuranda vicinity, a few hundred kilometres to the north, the beetle populations are normal and we see only a few at the lights each night. My observant neighbour, Christina, brought over this odd creature. It appeared on the bonnet of her car. 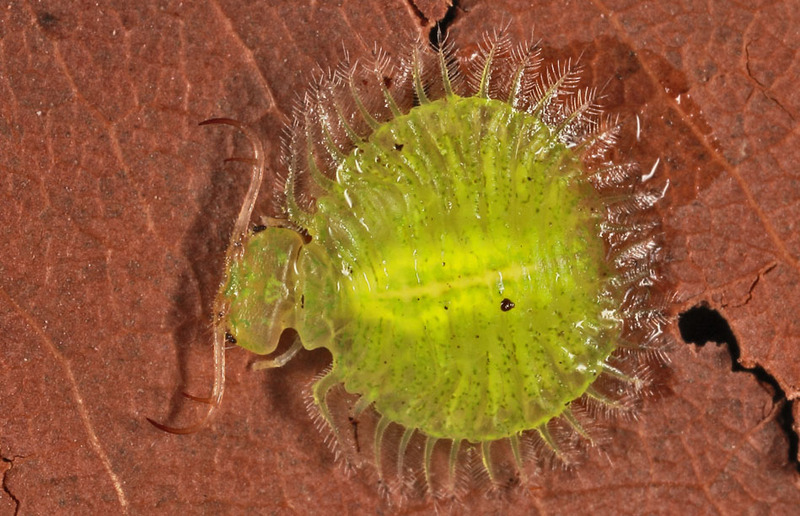 It is small, measuring about 5 mm in diameter. In general body form and jaw structure it seemed to be neuropteroid. As it slowly moves about with its jaws agape it presents a formidable appearance. But when it is not moving it sits motionless with the agape jaws tucked under its body apparently awaiting detection of some unsuspecting prey. The function of the gill-like structures that surround the body is unknown, at least to me. 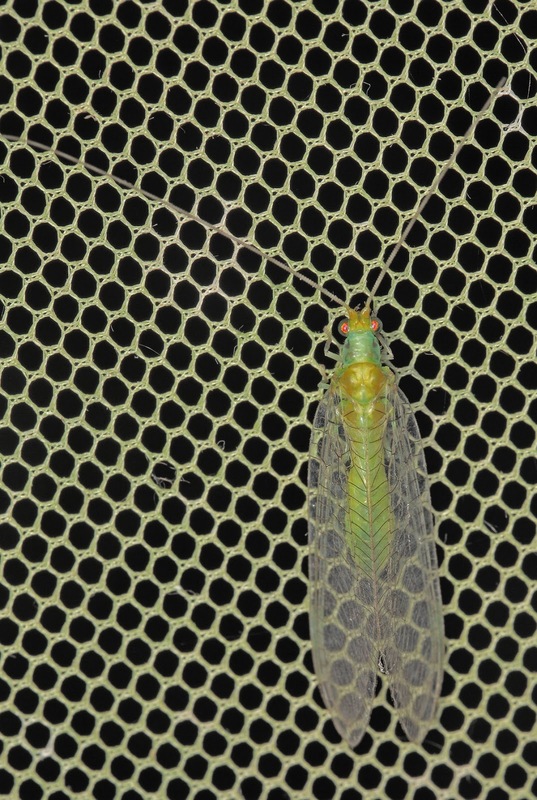 The jaw with its "subapical hook" is not unlike that of the Ant-lion reported in the blog below. In fact, it is a neuropteroid. A glance at the tome "The Insects of Australia" reveals a beautiful illustration of this species or something very similar. It is the larva of a member of the family Nymphidae. This family is known from fossils as well as living forms. 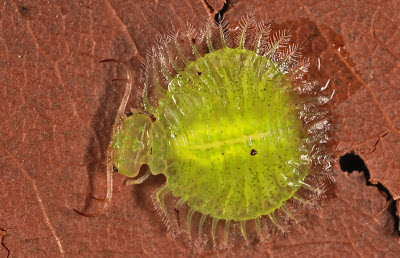 I've never seen an adult nymphid at the lights in Kuranda. The adults could be mistaken for ant-lions by the casual observer. This green larva is most likely a member of the genus Osmylops. 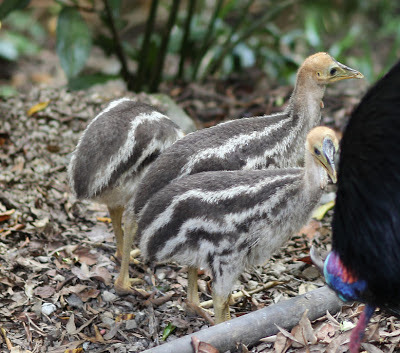 After several months absence Mr Cassowary appeared with this year's crop of chicks. House, on the other side of Black Mountain Road. It is our understanding that this male is about 40 years old. 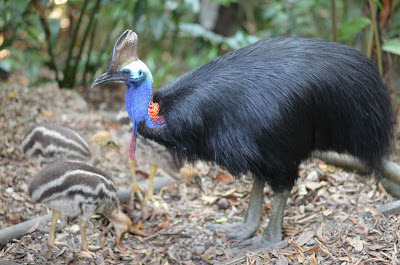 in that time he has learned, we hope, the dangers of road crossing and that one must be careful with callow young cassowaries. The reason for the concern this year is that the powers-that-be have decided to harvest the pine plantations on Black Mountain Road. Potential danger commenced with roadworks and attendant heavy vehicular traffic. Now more than 10 times a day logging trucks barrel down the road using compression braking to slow down. 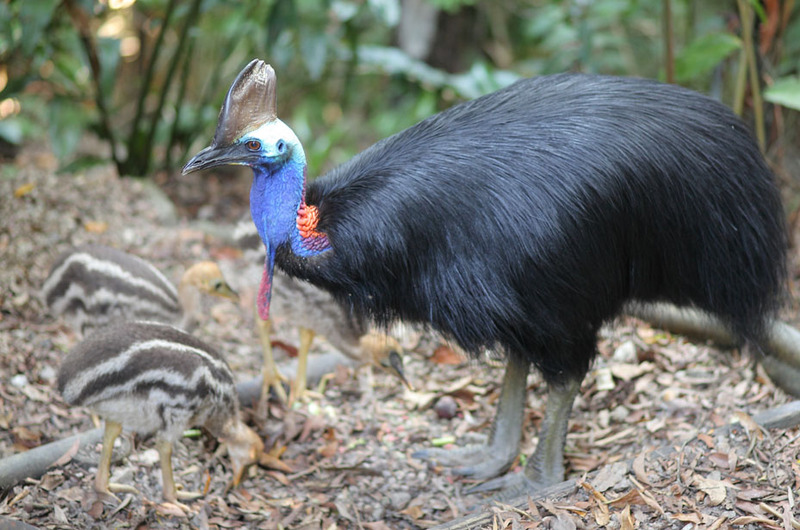 They could never stop in time to avoid a crossing cassowary. 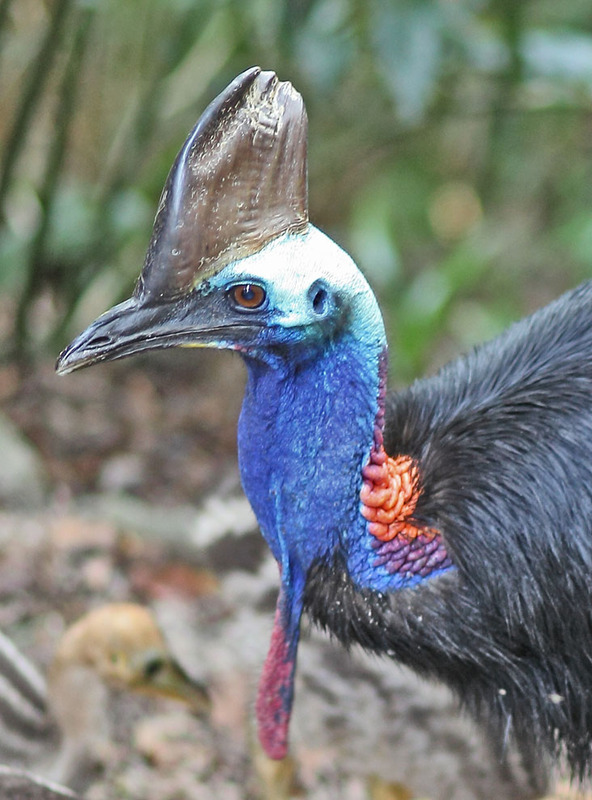 Compounding the danger to the Cassowaries is a Goshawk nest right over the road. The appetizers the occupants toss out of the nest are irresistible to the Cassowaries and they venture on onto the road amid the traffic to dine on the scraps. How long all this will continue is anyone's guess but we hope that Mr Cassowary has the ability to "understand" (Buck) the dangers of the busy road. If it means fewer visits to this side until the logging is complete, then we can live with that.